We just got in our full assortment of flower bulbs from Holland and they are looking great! Now through the early parts of November are the best times to plant spring-blooming flower bulbs, such as tulips, daffodils, hyacinths, crocus, and more! These flowers are the first blooms that we see each spring and are such a welcome sign to our gardens after a long and cold winter. 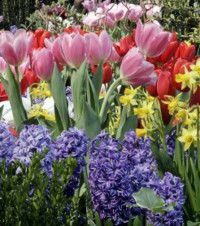 These bulbs are really simple to plant and they will come back year after year; there is no maintenance or replanting needed. Stop by soon for the best selection and plant any time before the first frost!